Another month down, another (low) word count in the books. 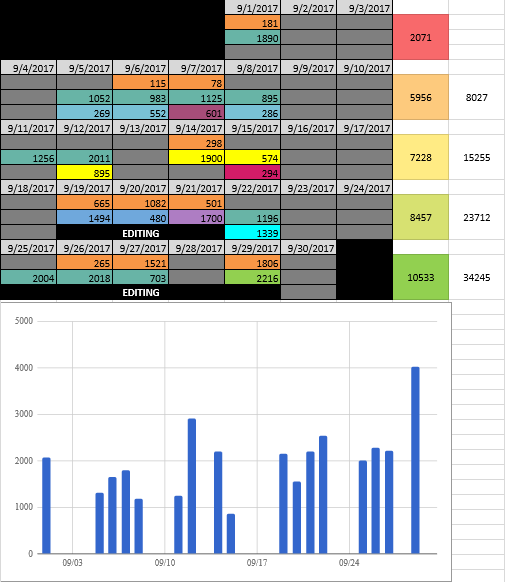 September came in about 9k short of January, previously my lowest recorded w/c for the year. There were many distractions, several days were I was not at a desk, and much editing was done, so I’m not upset by that number. It’s still above the totals for september in both 2015 and 2016, and still above the average for the whole of 2015. Woo. This month also came with the realization I’ll need to alter my schedule for the end of the year to stay on top of things, on target for finishing those major tasks that just can’t wait, and still managing to stay sane.